🌿 I macerated this full strength Burdock Root tincture for 3 months in alcohol. I triple filter the herb but I do not remove any herb matter that wishes to remain with the natural medicine that the plant has created. If the will of the herb after three filters is to remain, then it is the will of the plant to be honored. Burdock Root is a great herb to use proactively for liver, gallbladder, & digestive support & also a powerful herb to help with toxin and allergen filtration. I recommend Burdock Root during the spring for the internal systems support + elimination assistance it gives. This helps with optimal functioning & with anti-allergen effects for dogs with itchy &/or dry skin. This is because the skin is showing us what’s already been occurring within the body. Skin issues are a symptom of an internal root cause generally related to inflammation. The herb helps with the effective processing of fats which helps ease up the digestive system load. 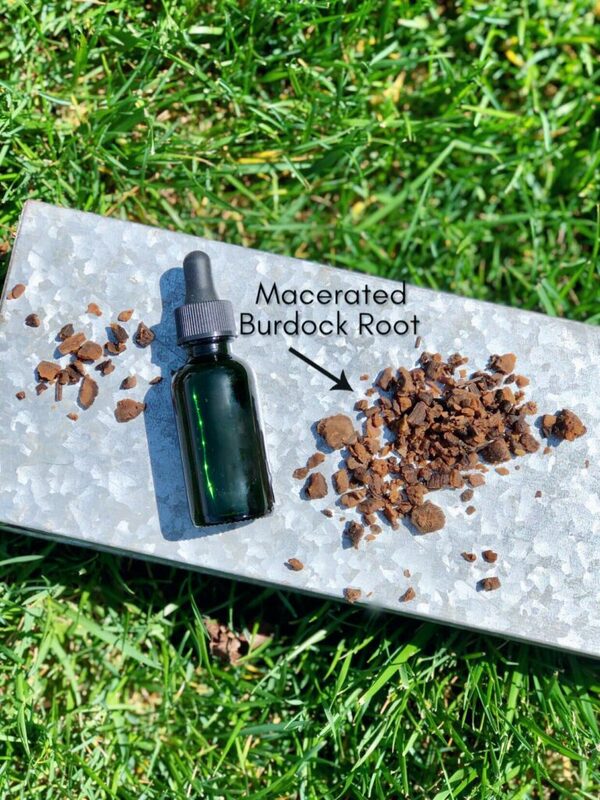 Burdock Root is known as a “blood filter” which is why it is great at aiding in the flush of toxins and is used during a blood cleansing protocol. Liver + kidney support are given during this filtration process. Parts of the plant used: Roots & seeds. Internal use: System cleanser, liver support, anti-inflammatory & prebiotic. Dosage depends on the dog. Full dosage is 1 drop x 3 per day for every 25 lbs. of dog. A safe way to begin is with 1 drop per 25 lbs. of dog x 2 per day for the first three days to ensure there is no adverse reaction. On day four, increase to 1 drop for every 25 lbs. of dog x 3 per day. Work your way up as stated over the first four days & then administer consistently at full dosage for 6 weeks. Full Dosage: 1 drop per 25 lbs. of dog three times per day. Do not give with meals. Administer this tincture away from meals. Document as you go to see if there is any improvement. I learned how to correctly work with herbs for folk tinctures from Canine Herbalist, Rita Hogan.